Unless you’re a professional writer who makes enough to forgo the day job, finding time to schedule writing is one of your biggest challenges. And, everyone has their own way of dealing with it. Stephen King set up a little school desk in the laundry room of his trailer when he wrote Carrie during the evenings after the kids were in bed. Probably many of my indie writer friends and even some traditionally published authors can relate. Carrie, which, according to his book, On Writing, he later threw in the trash because he didn’t like it. His wife later retrieved it and sent the crumpled mess to a publisher who agreed with her on it’s merits. Many writers have a particular time and place they set aside for writing, whether it’s in the evenings at their kitchen table or on a laptop while sitting on the sofa after the kids are in bed. Others try to steal a few minutes here and there to write. Some even sit up in bed with the next great book idea and rush to get it down before the fleeting thoughts fade. I’m not sure there is a “right” way to schedule writing — it’s a function of what’s right for you. But, if you’re still struggling with finding time to write, here’s some advice I’ve gleaned from writers over the years. First, a disclaimer — I don’t always follow my own advice. Just like your mom, I ask that you do as I say, not as I do. I think it’s critically important to schedule writing time every day — at least 5 days a week. Stephen King recommends 2000 words a day, but I think that’s a bit much. 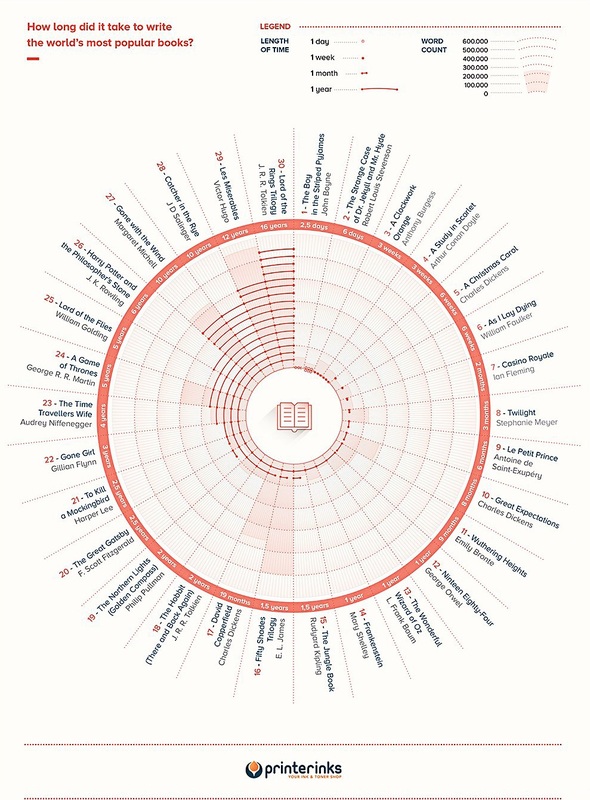 Look at the image below and you’ll see some really important books and how long they took to write — which varies from 2.5 days to 16 years. I would definitely recommend you stay within that timeframe somewhere — and preferably toward the shorter timeframe. I wrote Buried Ladies in about 3 months, but spent another 2-3 editing it, which, in my case, was pretty significant. It’s taken a little longer to write the sequel, Scars of the Past, mainly because I was distracted with formatting and marketing the first book. I anticipate releasing Scars of the Past in time for the Brain to Books Con in April. I don’t meet my 2000k words goal every day, but I do endeavor to work on it every day — except the weekend, which I devote to family and me time. Sometimes that’s only a bit of editing or some research, sometimes it’s writing whole chapters. The challenge to schedule writing time is dwarfed by other issues in writing and the biggest is writer’s block. I learned an effective way to deal with writer’s block in a graduate writing course. It’s called free writing. With free writing, you don’t let common writing challenges, like grammar, spelling, story, etc, interfere with your writing. Just write … anything that comes to your head is great. Just put it down on paper. Worry about spelling and grammar later. Or where it fits in your story, if at all, can wait. Just write something. Preferably write uninterrupted for 30 minutes (or more) without censoring yourself. Maybe what you write is total crap and you throw the whole thing away, but, more likely, you’ll find some gems in the unfettered writing you un-self-consciously generated. Sometimes we’re our own worst critics or too timid to write what we want. Free writing gets you beyond all that. Some folks us Scrivener to help organize these bits of writing. I’ve found Scrivener has a steep learning curve that I’m not willing to invest my limited time in learning. Instead, being OLD, I keep a pen and paper beside my computer and a white board behind my desk. If I’m having trouble free writing on my current novel, I’ll just scribble down something on these low-tech devices. Another thing I find I do is basically free write my novel across a large number of sessions. Mostly I free write at the current position, but sometimes I’m inspired to free write about something earlier — or later. I just free write wherever I want because, with word processing, I can move bits around wherever they fit. That also means I’m writing basically a skeleton of my novel. That’s probably why my editing process is massive, adding more than a third of the finished word count to the novel. My first edit, the most massive, involves fleshing out my characters and scenes, adding descriptions and dialog, and filling in gaps I left in the story. The next edit involves cleaning up the story to make sure it flows well, moving and deleting bits that don’t work and doing continuity to make sure I’m not contradicting parts of the story in other parts. Finally, I do 2 edits for grammar and spelling; first on screen, and second on paper. Finally, I format for print and ebook and I’m off to the races.